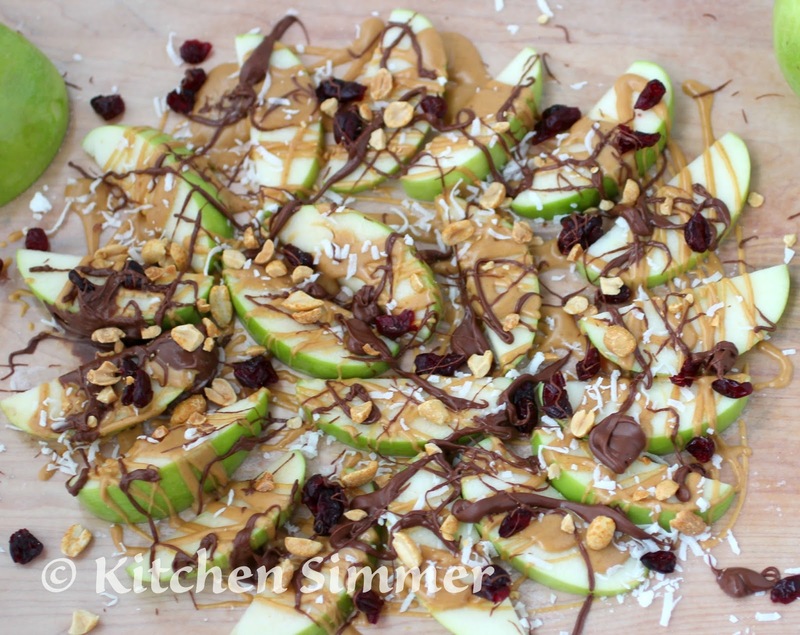 Kitchen Simmer: Apple Slice "Nachos"
My Apple Slice "Nachos" have fresh slices of tart Granny Smith apples drizzled with peanut butter and chocolate and then sprinkled with chopped peanuts, sweetened coconut and dried cranberries. 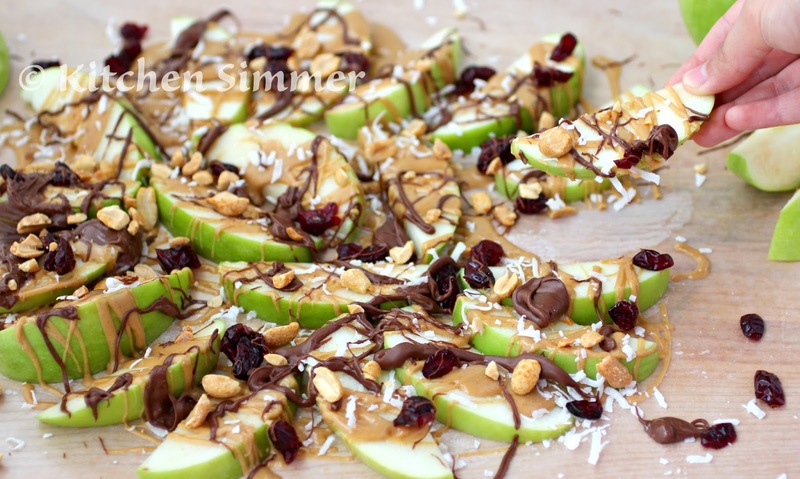 It's a perfect snack food to enjoy any time or even as a dessert. My kids crave a fun and delicious snack to enjoy when they come home from school. 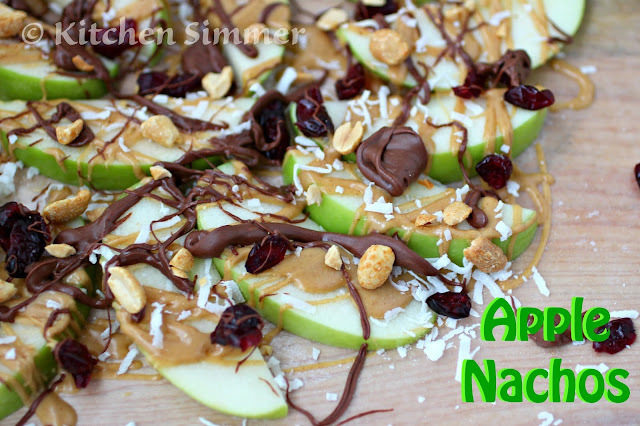 I am always trying to get them to eat more fruit so these Apple Slice "Nachos" are one snack that this Mom and kids can happily agree on as a daily snack. We make these nachos together as a family, so my little "Chefs in the Kitchen" love that they get to help make them. I usually cut and soak the apples in some salted water so they don't brown before picking the kids up at school. 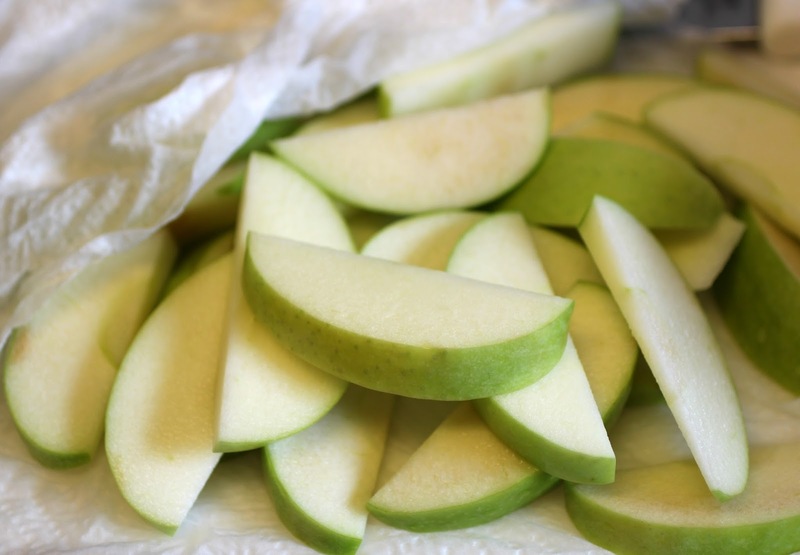 Now, I used Granny Smith apples because I love them for their tartness, but you can use your favorite apple variety instead. When the kids come home, they wash their hands and dry off the apples on some paper towels first. Then they get the chocolate and peanut butter heated in the microwave. The kids love doing this part and since there are two things that need to be heated up, I give them each a bowl to work on. 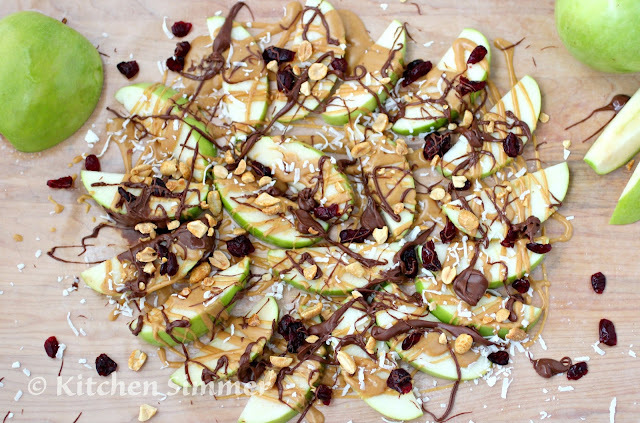 I then chop the roasted peanuts and get the other toppings ready so we are all set to make these fun apple slice nachos. 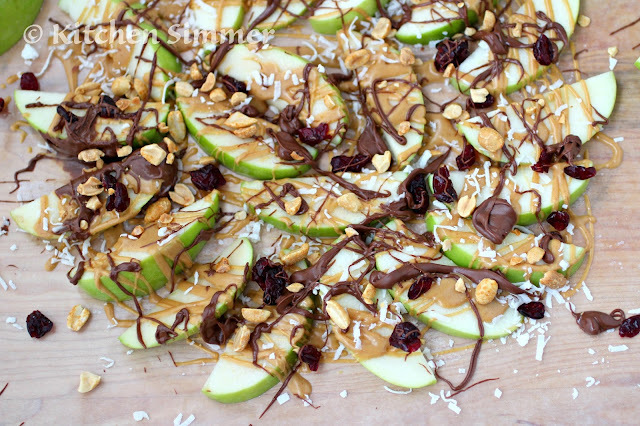 The kids love drizzling the peanut butter and melted chocolate over all the sliced apples. Then they simply top the "nachos" with their favorite toppings. The hardest part is to let the nachos sit for about 5 minutes to let the peanut butter and chocolate set. I usually get them to empty their lunch boxes at this time so that keeps them occupied. When the nachos have set, we happily dive in and enjoy each bite. I may not be a kid, but I am a big kid at heart and I love these apple nachos so much. My husband also enjoys them so we are always sure to save a few slices of "nachos" for him to enjoy when he comes home. Note: These are our usual toppings of choice, but you can use mini marshmallows, white chocolate, other types of nuts or nut butters, colorful sprinkles etc.... These "nachos" can be customized to your taste. Step 1: Set up the salted water bowl by placing salt in a bowl and adding 1 cup of warm water to dissolve the salt. Then follow up with the cold water. Next slice apples into wedges, removing the core and placing into the salted water. If kids are helping, a parent or adult needs to do this part since a knife is used. 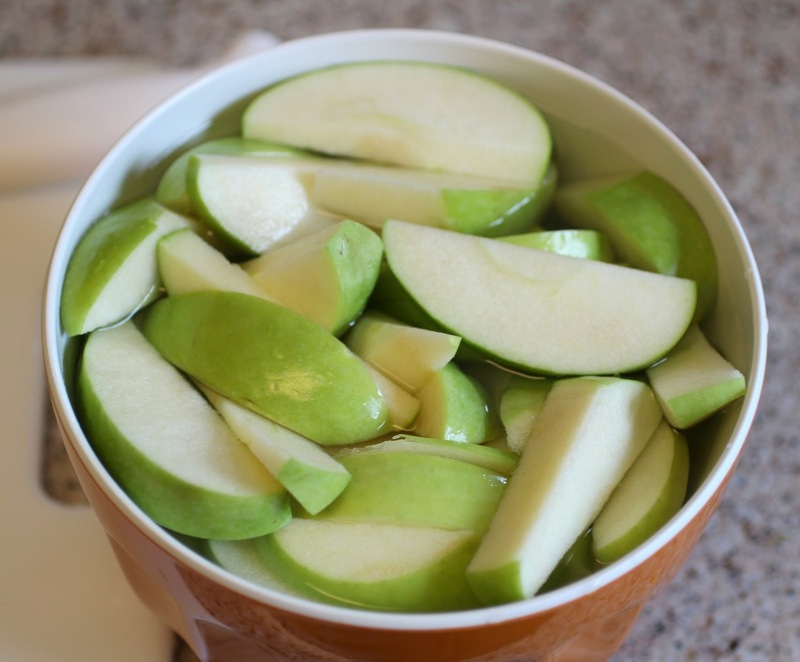 Allow apples to sit in water for 5 minutes. Then place the apples on a paper towels and blot to remove any water from the surface of the apples before proceeding. 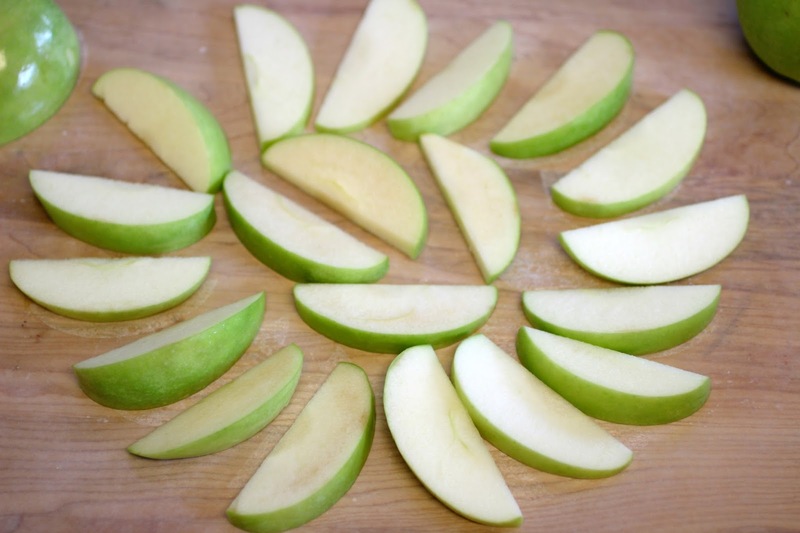 Step 2: Arrange apple wedges in a single layer on a plate or cutting board. Tip: I like to line my cutting board with a piece of wax paper for easy clean up. Then in a microwave safe bowl heat peanut butter for 20-30 seconds and stir well. 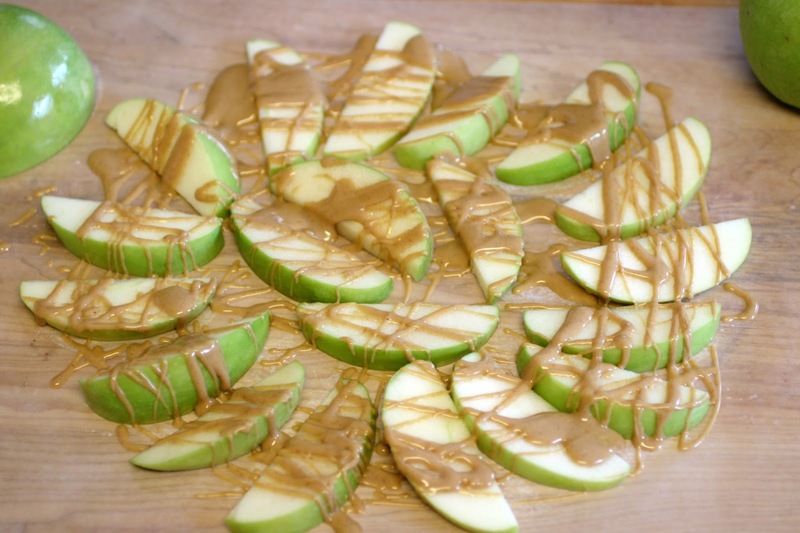 Use a spoon to drizzle over apple slices. Step 3: Next microwave the chocolate chips in 30 seconds increments in a microwave safe bowl, always stirring well to get heated chips moved around. Careful not to burn chocolate. Once chocolate starts to melt, switch to 10-15 second increments. 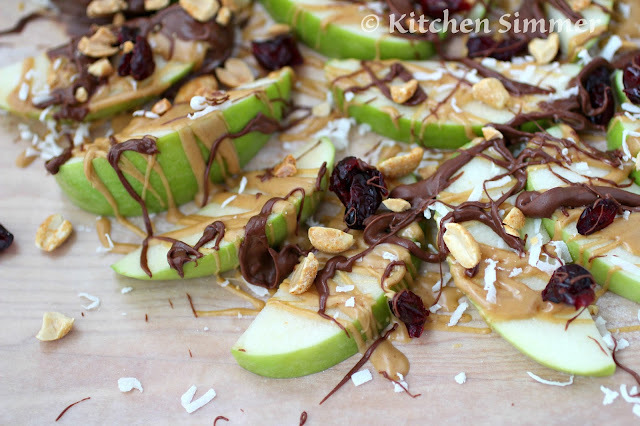 Once chocolate is fully melted, use a fork to drizzle chocolate over apple slices. Then sprinkle toppings as desired. Allow nachos to sit for at least 5 minutes to set up. Then dig in and enjoy. What a fun snack idea! Perfect for customizing to meet everyone's tastes! 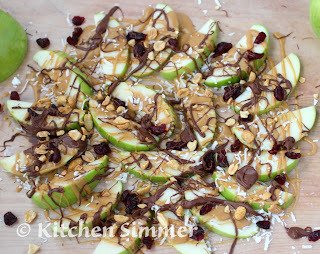 I'm not a kid either - but I would get as much joy from making these as I would eating them too! 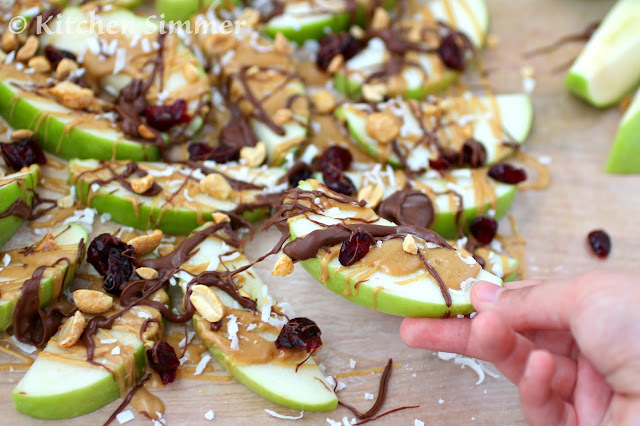 These look amazing, I would love to make these with the kids for a snack! 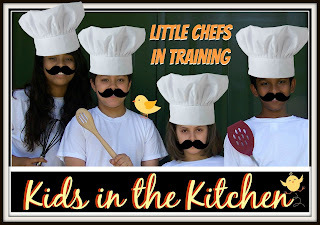 These yummies are a hit for all ages! I would have to come up with several substitutes for Gabbi due to her peanut allergy. These also qualify as a dessert! What does the salted water do for the apple slices? The salted water keeps the apple slices from browning. It also gives a nice flavor to the apple and compliments the chocolate.